Women of Contemporary Fiber Arts is a show celebrating six local women making a wave in the fiber community. Austin, Texas is a colorful city filled to the brim with talent and diversity in the realm of art and this exhibition showcases a medium with many faces: Fiber. Experience a selection of fiber artwork in categories including sculpture, jewelry, deconstruction, woven, quilted, patchwork, botanically dyed fabrics, shibori and more. Free Parking in the rear of our building. Mafe Soltero is a fiber and multidisciplinary artist who explores the beauty of the chaotic uncertainty found in thoughts. Born in San Juan, Puerto Rico, Mafe Soltero credits her Boricua culture for influencing her affection for lively color. Her childhood memories are flooded with the vibrant color combinations that surrounded her daily life growing up in the Caribbean. After exploring various art disciplines at the Savannah College of Art and Design, Mafe eventually found herself submerged in fiber arts. She developed an immediate connection to the diverse processes of meticulously creating objects with her hands. She exhibited her Tiny Monsters sculptures in the 2015 Smithsonian Craft Show at the National Building. She was also awarded the Young Emerging Artist Scholarship for the Alegre Quilt Retreat of 2014. Currently expanding on her Distortion series, Mafe Soltero focuses on transforming fiber materials into sculptural beings to represent distorted memories. Initial K Studio is the brainchild of Austin based designer, Kristi Schroeder, who specializes in creating modern quilts and decor for the home. Ms. Schroeder came to quilting through her work as a graphic designer in the corporate world. This native Texan is a world traveler who draws inspiration for her quilts in art, fashion, and textiles from around the globe. Ms. Schroeder is a member of the Modern Quilt Guild and has been published in Love Patchwork & Quilting, Make Modern Magazine, and QuiltCon Magazine. Her first book Southwest Modern: From Marfa to New Mexico: 18 Travel Inspired Quilts will be released in Fall 2017 by Lucky Spool Media. Working with textiles has been a lifelong journey for Carol Hargus. Her intention is to extend the lifespan of fibers and textiles through different techniques combining manipulation, deconstruction, weaving and hand dying (techniques such as Shibori and Ice Dying), result in unique visual art to enhance our surrounding environments. Inspirations include travels, nature and the textiles themselves. Gabrielle is a fiber artist living in Austin, Texas. She started Copper Dot Weaving as a way to express her passion for fiber, textiles and handmade goods. As a life-long dabbler of all things "craft" and a strong desire for a creative outlet, weaving became an immediate addiction. Gabrielle is most inspired by combining the natural textures and color of fiber into modern geometric designs. She loves the "no-rules" process of weaving and how each product is completely unique. 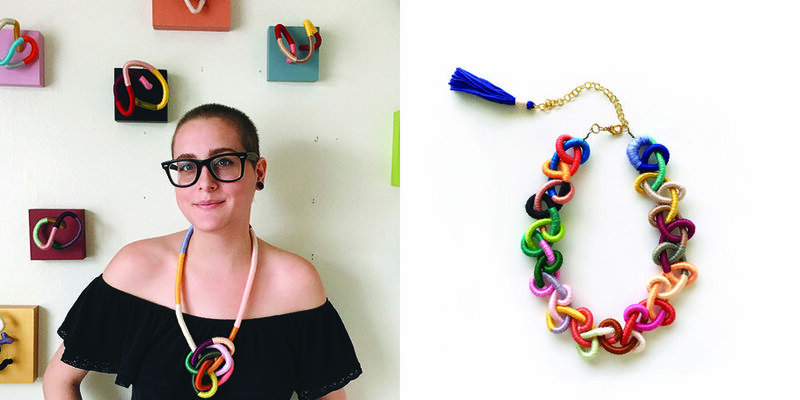 She also loves to explore the possibilities of using fiber in other mediums such as jewelry and accessories. Copper Dot Weaving's tapestries and handwoven goods add a boho vibe through warmth, color and texture. Kelcie works with natural fibers and colors derived from the Earth. Her work is a vehicle for emotional and spiritual exploration. Using living matter to create her works, she studies their historical, magical and medicinal associations as they call to her.The pieces are alive with vital light and and joyous plant energy; the artist collaborates with the plants with the intention that each piece has an esoteric message that is subconsciously healing the viewer. She received her BFA in Fiber Art at the University of North Texas in 2013.